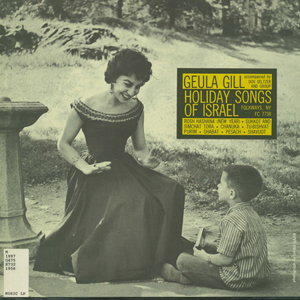 Geula Gill was a stand out among several beautiful Israeli songbirds of the 1960s who took the US by storm (like Hannah Ahroni and Shoshana Damari). She was popular both in Israel and the US, putting out several albums in both countries and appearing on radio, television and Broadway. 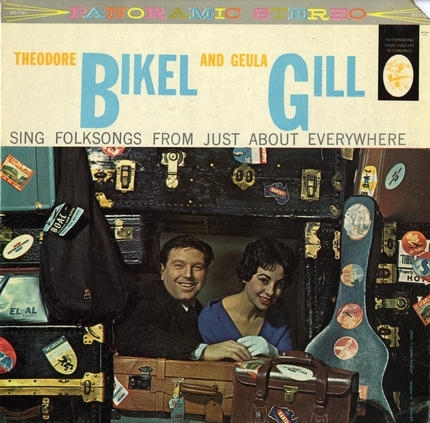 She recorded with the infamous Theodore Bikel– “Theodore Bikel and Geula Gill Sing Folksongs From Just About Everywhere” (Elektra, 1959). 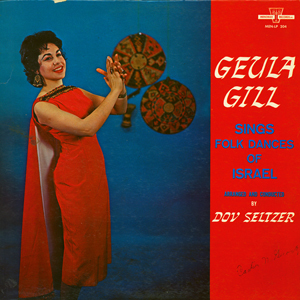 Geula was born in Palestine and grew up in a musical family. She appeared as a soloist in the Tel Aviv Choir and also performed during her service in the army. After the army, she graduated from the Teachers seminary and became a kindergarten teacher in one of the kibbutzim. But she felt the call of the stage and went on to tour the US, Canada and South America, along with her husband Dov Seltzer (Israel’s most famous conductor). She recorded albums as a soloist on Folkways and Epic (“Israeli Dances” “Yemenite Folk Songs”, “Holiday Songs of Israel”) as well as several albums with the Oranim Zabar Israeli Troupe on Elektra. She currently resides in Los Angeles. If anyone knows more about how we can reach Geula, please be in touch!